- Reports claim that two years after her death in the United states, the governor is set to settle with a young bride Former Governor of Gombe State and Senator representing Gombe Central senatorial district, Danjuma Goje, has reportedly taken a young lady as his new bride. Recall that the senator lost his wife, Hajiya Yelwa , in 2017. The late, former first lady of Gombe state, died on Monday, October 30, after a brief illness at the She was aged 55. 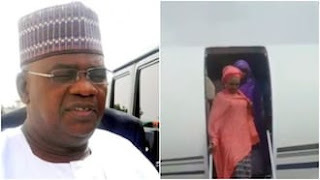 Recent reports claim that two years after the passing of his wife, Senator Goje is set to settle down with new bride who hails from Bauchi. A clip showing the new bride alighting from a jet with some family members has surfaced online. There are reports that she was taken from Bauchi to Abuja where she is to meet her husband and officially become the new bride of the senator. Meanwhile, Senator Danjuma Goje has been asked by some former governors to accept President Buhari’s choice of Ahmad Lawan for Senate president. A former governor who pleaded not to be named said Goje is qualified to lead the Senate but they don't want him to disagree with Buhari. The president and some leaders of the APC earlier had a meeting with Senator Goje over the position.